WICHITA – KU men’s basketball great Paul Pierce is one of 13 named to the Class of 2018 Kansas Sports Hall of Fame, the hall announced Wednesday. The induction ceremony will be held on Sunday, October 7, 2018, in Wichita. Joining Pierce in the 2018 class is: three-time All-American K-State football player and NCAA record setting punt returner, David Allen; three-time Missouri Valley Conference selection and all-time WSU women’s rebounding leader, Angela Buckner from Wichita; University of Missouri standout, 10 year NBA veteran, and long-time NBA head and assistant coach, Larry Drew from Wyandotte; two-time All-American tennis selection at UCLA and professional tennis player, Buff Farrow from Wichita; 85-time KCAC Championship Southwestern College track and cross country coach Jim Helmer from Winfield; four-time NAIA All-American basketball player at Benedictine and member of 1967 National Championship team, Darryl Jones; founder and owner of the Kansas City Royals and long-time Kansas resident, Ewing Kauffman; three-time Big 12 Conference selection and K-State women’s basketball all-time three point shooting leader, Laurie Koehn from Moundridge; 2012 Gold Glove and Silver Slugger award winner and twelve year MLB veteran, Adam LaRoche from Fort Scott; 1970 K-State football All-American and 13 year NFL veteran, Clarence Scott; five-time state football championship coach at Pittsburg-St. Mary’s Colgan, Chuck Smith from Pittsburg; 13-year MLB veteran and baseball scout, Mitch Webster from Larned. Ewing Kauffman will be honored posthumously. The storied playing career of Pierce concluded when he announced his retirement from the NBA following the 2017-18 season. Affectionately known as “The Truth,” Pierce played 19 seasons in the NBA, which was the longest-tenured Jayhawk in the NBA of all-time. After being selected 10th overall by the Boston Celtics in the 1998 NBA Draft following his junior season at KU, Pierce went on to become a 10-time NBA All-Star, four-time All-NBA selection, NBA champion (2008) and NBA Finals MVP (2008). With 26,397 career points, he ranks 15th on the NBA’s all-time scoring list. 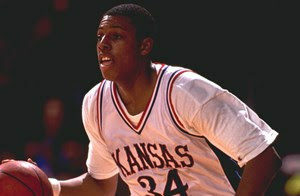 As a Jayhawk, Pierce was a 1998 Consensus All-America First Team selection. In just three seasons at Kansas, Pierce ranks 10th on the KU career scoring list with 1,768 points and also ranks in the top 20 in rebounds and steals. He was most outstanding player in both the 1997 and 1998 Big 12 Tournaments and his jersey was officially retired from KU in during the 2003 season. The 13 member class raises the total number of Kansas Sports Hall of Fame inductees to 286. The Kansas Sports Hall of Fame is in its 57th year of operation. Online sales for 2018 Induction Ceremony tickets go live Wednesday, August 1, 2018, at www.kshof.org. KUAthletics.com: The official online source for Kansas Athletics, Williams Education Fund contributions, tickets, merchandise, multimedia, photos and much, much more.